As the car was hurtling back toward Washington and Lucy and John, I made the mistake of mentioning Wonder Books in Hagerstown, Maryland. So it was one final bookstore stop. I’m not sure how I managed to do any browsing whatsoever given how badly I needed to wee. Alas the store has no restroom. When we finished we did manage to find one at the Aldi in the same strip mall. With the exception of the Taylor, these books aren’t in the greatest shape and kind of sums up the state and condition of Wonder Books. I bought the Bryson because I have listened to much of them book on audio and there is so much I want to be able to read for myself. 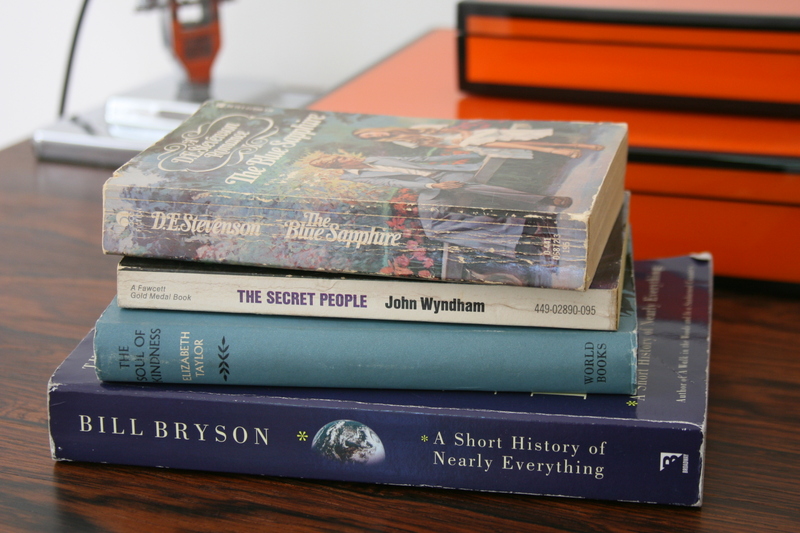 The Secret People is a John Wyndham I haven’t read. Yay for that. And The Blue Sapphire actually replaces a slightly better copy of that edition that I also bought at Wonder Books but left on a cruise ship library after reading it back in 2012.